Am I at risk for heart disease? * But the good news is there's a lot you can do to prevent heart disease. When people talk about heart disease, they are usually talking about coronary heart disease (CHD). It’s also called coronary artery disease (CAD). This is the most common type of heart disease. When someone has CHD, the coronary arteries (tubes) that take blood to the heart are narrow or blocked. 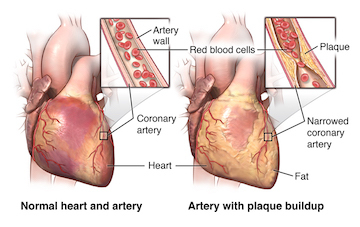 This happens when cholesterol and fatty material, called plaque (“plak”), build up inside the arteries. * When plaque blocks an artery, it’s hard for blood to flow to the heart. A blocked artery can cause chest pain or a heart attack. A heart attack happens when blood flow to the heart is suddenly blocked. Part of the heart may die if the person doesn’t get help quickly. Not everyone who has a heart attack will have all the signs. Don’t ignore changes in how you feel. Signs of a heart attack often come on suddenly. 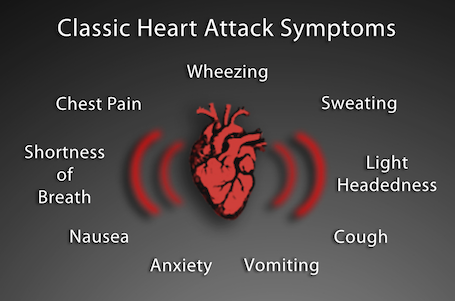 But sometimes, they develop slowly – hours, days, or even weeks before a heart attack happens. Talk to your doctor if you feel unusually tired for several days, or if you develop any new health problems (like pain or trouble breathing). It's also important to talk to your doctor if existing health issues (like pain) are bothering you more than usual. If you’ve had a heart attack in the past, it’s important to know that symptoms of a new heart attack might be different from your last one – so talk with your doctor if you have any concerns about how you feel. Don’t ignore any signs or feel embarrassed to call for help. Acting fast can save a life. An ambulance is the best and safest way to get to the hospital. Take steps today to lower your risk for heart disease. * Control your cholesterol and blood pressure. High cholesterol and high blood pressure can cause heart disease and heart attack. If your cholesterol or blood pressure numbers are high, you can take steps to lower them. - Get your cholesterol checked. - All men age 35 and older need to get their cholesterol checked. - Get your blood pressure checked. Starting at age 18, get your blood pressure checked regularly. High blood pressure has no signs or symptoms. * Know your family’s health history. Your family history affects your risk for heart disease. Use this family health history tool to keep track of your family’s health. Share the information with your doctor or nurse. * Ask your doctor about taking aspirin every day. If you are age 50 to 59, taking aspirin every day can lower your risk of heart attack and stroke – but it’s not recommended for everyone. Talk with your doctor to find out if taking aspirin is the right choice for you. added sugars, and sodium (salt). Heart-healthy items include high-fiber foods (whole grains, fruits, and vegetables) and certain fats (like the fats in olive oil and fish). * Drink alcohol only in moderation. If you choose to drink alcohol, drink only in moderation. This means limiting your drinking to no more than 1 drink a day for woman and no more than 2 drinks a day for men. Drinking too much alcohol can increase your risk of heart disease. Getting active can help prevent heart disease. Adults need at least 2 hours and 30 minutes of moderate aerobic activity each week. This includes walking fast, dancing, and biking. If you are just getting started, try walking for 10 minutes a day, a few days each week. Then add more activity over time. * Stay at a healthy weight. People who are overweight or obese are at an increased risk for heart disease, high blood pressure, and type 2 diabetes. If you are overweight or obese, losing just 10 pounds can lower your risk of heart disease. Find out how to control your weight. If you don't know if you are at a healthy weight, use this BMI calculator to figure out your BMI (body mass index). * Quit smoking and stay away from secondhand smoke. Quitting smoking helps lower your risk of heart disease and heart attack. Avoiding secondhand smoke is important, too – so keep your home smoke-free. If you have guests who smoke, ask them to smoke outside. Managing stress can help prevent serious health problems like heart disease, depression, and high blood pressure. Deep breathing and meditation are good ways to relax and manage stress. * Give yourself a break. Take a few deep breaths to help manage stress. Thank u for sharing. My brother died of heart attack before 6 years with same symptoms as described. This is very useful for everyone.